If you own an RV and you like spending time in nature, then getting RV solar panels must have crossed your mind at least once. And why wouldn’t it? It’s ecologically useful because it reduces carbon emissions, it requires no fuel and very little maintenance and it is almost completely silent. However, RV solar panels are an investment like any other, so before getting a solar panel system, you might consider your needs and habits. Of course, if your primary concern is the carbon emissions and you want to lower them no matter the cost-efficiency, then it is, by all means, a reasonable investment. If you are primarily concerned whether that investment will pay for itself in a matter of years and further lower your expenses, there are a few things to note. Is It the Right Investment For You? In order to answer this question, let’s take a look at how often, and for which purposes do you use your RV. 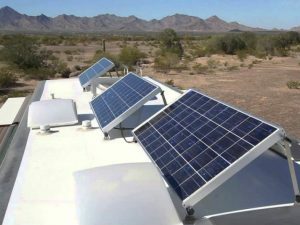 If you like to use it once or twice every couple of months, then it would be wiser to not get a solar panel – it will take years, or possibly even a decade before the system pays itself off, meaning that from a monetary point of view, this wouldn’t be the right investment for your lifestyle needs. By the same token, if you often going camping on regular camping spots, the fees for your stay there usually include shoreline power, so getting a solar panel system wouldn’t do much for you in terms of cost saving. However, if you’re somewhere in between these two types of RVers, and you often go camping, but you’re not a huge fan of organized campsites and prefer going a bit off the beaten track and enjoy nature alone, then a solar-powered RV might just be your thing! Most RV solar power systems consist of four basic elements. First, there are, of course, solar panels. There are different shapes and sizes available, and you really have to gauge your energy expenditure needs when deciding on their size and type. They are installed at the roof of your RV and are used to collect the Sun’s energy and convert it to electricity. They are typically made from two different materials: Polycrystalline, which is the most popular choice, because it’s cheaper and fairly efficient, and Monocrystalline, which is more efficient than the latter, but also has the price to match its efficiency. There is a third type of solar panels on the market, it’s called a thin-film solar cell, but since it’s less efficient than both Polycrystalline and Monocrystalline, we wouldn’t recommend getting it. The second part of the solar system is the storage unit. Naturally, the energy collected by the solar panels has to be stored somewhere, so a battery of a great capacity is vital for the preservation of solar power for RV. There are three types of RV batteries. The oldest technology in the bunch is used for lead-acid batteries. While they are the cheapest option that’s available virtually everywhere, they come with quite a few problems. For instance, draining these batteries to lower than 50% of their full capacity will significantly shorten their lifespan, which ranges from 500-1000 cycles. Furthermore, the acid from this battery could potentially spill, causing damage to its surroundings and burning the skin. Sure, you might always keep it more than 50% full and spillage might never happen – but in the end, is it worth risking it? Both more advanced options are more expensive than the lead-acid batteries, but they also come with some pretty cool advantages. The AGM batteries bear no danger of spills and are resistant to vibrations (which, you know, is kind of important when having an RV). Not only that, but they charge four times faster and can store up to 15% more energy than lead-acid batteries! And lastly, the Lithium-Ion batteries might ring a bell, because they’re most commonly used in laptops and mobile phones. One of the greatest thing about them is that they are 50% lighter than a standard lead-acid battery, have a lifespan that is four times longer, and come with waterproof housings. What’s more, they can operate quite fine on extremely low temperatures. However, keep in mind that they are usually the most expensive of the bunch. The third part of this system is the charge controller. Its role is to regulate energy in vs. energy out, so it sits between the solar panels and the battery. It optimizes charging, stopping it when the battery’s at 100% and it also shuts down the system if the total power within the battery falls beneath 50%, which comes as especially useful with lead-acid batteries. The last part of the system is that final touch that allows magic to happen – the inverter. The power stored in the battery and produced by motorhome solar panels is DC power. Most appliances use the AC power, and the inverter is there to make DC power into AC power, allowing the whole system to work. For an average RVer, the 800-watt solar power system can garner 4.000 watts in five hours of direct sunlight. This wattage is enough to run most of your appliances in one day. While it can do wonders, it can’t perform miracles – yet. This means that your AC unit, for instance, can’t run on solar power, because it just takes up too much of it, leaving your battery drained in no time. The truth is, even if you get a top-notch solar power system, you’ll still need to use gas generators from time to time: some days won’t be sunny, an unexpected rain will fall – you know, life will happen. So for ultimate comfort, it’s best to have a dual power source in your RV, just in case. When calculating the total cost of the RV solar power system, keep in mind that the cost of the four basic parts you see on the website (Amazon, eBay, etc.) doesn’t include the cost of installation. You can expect the total cost of installing a good RV solar power system to be around $4.000. 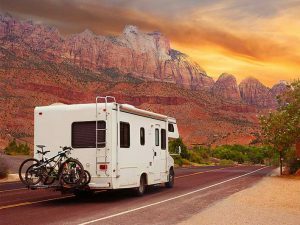 With daily use, it can pay itself off within 2.2 years, meaning that from that moment on, your RV expenses will be $0, or close to it. Pretty neat, huh?